5.40pm 5.4 miles in44 minutes. A short town centre run made more enjoyable as I have finally got myself an MP 3 Player. In the end I purchased an of the shelf Packard Bell Audio Key from PC World. It is a I GB player which is extremely lightweight comes with a clip and a plastic pouch to keep it in. It will probably only store about 300 WMA tracks but it is ideal for running as it is a flash drive MP3. PC World couldn’t really offer much help as they didn’t seem to know the difference hard disc and flash drive players. The assistant said they were all the same and all suitable for running and I suppose you can get away with using a hard drive player many of them have locks on the hard drive to prevent movement during exercise but I didn’t want to risk it. Before going for the Audio Key I had bought a very nice looking Phillips Hard Drive MP3 with 6GB brand new from E Bay. However my computer just wouldn’t recognise the player so I had to return. 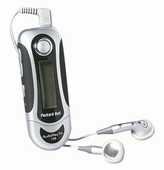 I then made an order for an MP 3 player from E Buyer which was called a Guru. However despite them taking my money and saying they had lots in stock the day before it was delivered they suddenly canceled the order and returned my money. So in the end I felt it much easier just to pop in to PC World and buy off the shelf.